This article is about the tributary of the Limpopo River. For other rivers, see Olifants River (disambiguation). Olifant means "elephant" in Afrikaans, Obalule, means "long, stretched-out one" and Lepelle means "slow-flowing" or "distant"
Course and catchment of the Limpopo River. The Olifants joins the Limpopo from the right, some 190 kilometers from the Indian Ocean. The Olifants River, Lepelle or Obalule (Afrikaans: Olifantsrivier; Portuguese: Rio dos Elefantes) is a river in South Africa and Mozambique, a tributary of the Limpopo River. 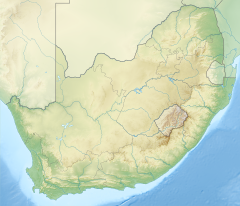 It falls into the Drainage Area B of the Drainage basins of South Africa. The historical area of the Pedi people, Sekhukhuneland, is located between the Olifants River and one of its largest tributaries, the Steelpoort River. The Olifants River has its origin between Breyten and Bethal, Mpumalanga Province. It flows north towards Limpopo Province through Witbank Dam and then the Loskop Dam and is forced east by the Transvaal Drakensberg, cutting through at the Abel Erasmus Pass and then flowing east further across the Lowveld to join with the Letaba River. It crosses into Gaza Province, Mozambique, after cutting through the Lebombo Mountains by way of the Olifants Gorge, becoming the Rio dos Elefantes, and finally joining the Limpopo River after 40 km before it enters the Indian Ocean at Xai-Xai north of Maputo. Overgrazing in sections of its middle course result in the river carrying away eroded soil after heavy rains. The Olifants river has become one of the most heavily polluted rivers in South Africa, not by human or industrial waste, but by thriving green algae. The Olifants River's largest tributaries are the Letaba River and the Steelpoort River known as Tubatse River. Other tributaries are the Tongwane, Blyde, Moses, Spekboom, Timbavati, Nkumpi, Ga-Selati, Klaserie, Makhutswi, Mohlapitse River, Lepellane River, Mohwetse River and Ngwaritsi River. Some tributaries, notably the Klein Olifants River (origin near Hendrina, joins the Olifants River downstream of the Middelburg Dam), the Elands, Wilge and the Bronkhorstspruit, rise in the Highveld grasslands. The Shingwedzi River flows close to the northeastern side of the Massingir Dam reservoir and joins the left bank of the Olifants about 12 km downstream from the dam wall. ^ "State of Rivers Report - The Olifants River System". Council for Scientific and Industrial Research. Archived from the original on 2007-07-03. Retrieved 2009-02-19. ^ Shingwedzi River: why is it the most polluted river in the KNP? Wikimedia Commons has media related to Olifants River (Mpumalanga). This page was last edited on 25 January 2019, at 09:11 (UTC).